Sundown Naturals is giving away samples. 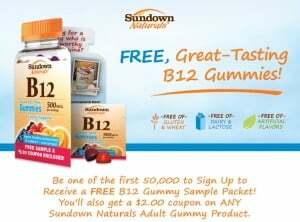 Check out their Facebook page to sign up for a sample pack Sundown Naturals B12 Gummy. Head over to the Sundown Natural Facebook page and “like” the page. Then, click on the Gummy Giveaway tab. The first 50,000 entrants will receive this freebie along with a $2 off coupon for your next purchase of Sundown Naturals Gummies.